Landon Collins isn’t having the best walk year. The Giants young Free Safety looked like he was on his way to superstardom just 2 years ago, and was in the running for Defensive MVP. Since then, Collins has put up a season and a half of pedestrian play. Granted, he has not been given a viable Free Safety to play next to, but if he wants to get paid big bucks, he needs to live up to expectations. It’s not that Collins is having a bad year, as he is still on pace to get over 100 tackles for his 4th straight season. The problem is, the impact plays that made Collins one of the best defensive players in football in ’16 have all but disappeared. He has 0 sacks since 2016 and only 2 interceptions, after accruing 4 sacks and 5 INTs in 2016. His Passes Defense numbers dropped from 22 his first 2 years to just 10 his last 2 years. The biggest area of concern was the same concern that Collins had coming out of Alabama. He is an absolute liability in coverage against Tight Ends, Running Backs, and Wide Receivers. Collins is simply too slow to react and diagnose passing plays. Even when he’s in the right spot, he fails to make plays. What Landon Collins looks like now is an in-the-box safety many labeled him as coming out in the draft in 2015. The best move for Collins might be a move to Linebacker and counted on in the passing game. He can focus on becoming more of a downhill player. With the Giants season teetering on the edge of irrelevance, I would like to see Collins get more time as a “money backer”. Bettcher created this position for Deone Bucannon last year. Collins was drafted as a safety, much like Bucannon and after the switch to linebacker he excelled. Right now, aside from the Giants franchising Collins next offseason, I do not want any part of locking him up long-term for what might be a LOT of money. He simply has not shown much outside of his 2016 standout year. Listen, I know George Kittle is currently one of the Top 5-7 Tight Ends in the league. He is a great player and he has been abusing defenses all year-long. Having said that, if Collins is truly a Top Safety in this league, he should not be getting abused by ANYONE that badly. Kittle was getting open at-will and was doing whatever he wanted both in the passing game and the blocking game. The main culprit? Landon Collins, who was tasked to cover Kittle for most of the night. Time after time, Nick Mullens targeted the (often) wide-open Kittle to the tune of 9 catches for 83 yards. Most of Collins’ tackles came down the field after long gains. Collins made a play or two in the run game, which we Giant fans have grown accustomed to. If you want to be paid like a Top Safety in the NFL though, you need to perform at a higher level than what Collins has been performing at these past two seasons. Plain and simple. 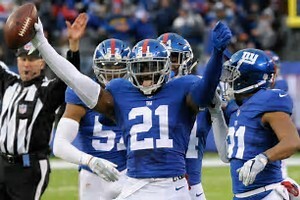 In conclusion, Landon Collins receives this week’s “Dud of the Week” award.